This press information is a summary of comprehensive specifications of the products. All figures and specifications may vary according to market. Also, data are subject to change upon homologation. Our goal at Mazda is to achieve Mazda Premium. That means gaining customers' trust and becoming an essential part of their lives by pursuing and forever refining the distinctive driving pleasure that is unique to the Mazda brand. The all-new Mazda3 unveiled at this year's Los Angeles Auto Show will play an important role in raising this driving pleasure to new levels and beginning a new era in which Mazda Premium will become a reality. What is Mazda's driving pleasure? In everyday situations – driving to work, to the mall, or taking a trip with the family – the car accelerates, turns and brakes in a way that feels natural and intuitive, like a tool you have been using for many years. The feeling of interaction is pleasurable and makes you want to keep on driving. Passengers can relax and enjoy the ride too because the motion of the car is congruent with natural human movements and feels natural to everyone on board. The design captivates you from the first glance, and the way its expression changes with the light and surrounding scenery makes you want to gaze at the car forever. Which makes you want to drive it again. Owning, driving and spending time with the car offers a truly satisfying experience. This is Mazda's driving pleasure. Last year, we announced our "Sustainable Zoom-Zoom 2030" long-term vision for technology development, which lays out how Mazda plans to use this driving pleasure in the search for solutions to the issues facing the earth, society and people. The all-new Mazda3 is the first commercial model to feature some of the technologies that will realize this vision – a revolutionary new gasoline engine called Skyactiv-X and a set of structural technologies called Skyactiv-Vehicle Architecture. It is also the first to adopt a more mature interpretation of the Kodo design language that explores the essence of Japanese aesthetics and pursues elegant and sophisticated styling. Mazda3 is a global strategic model that has led the company from both a brand and business growth perspective. Since its launch in 2003, the model has sold more than 6 million units, delivering Mazda's driving joy to customers around the world and raising awareness of the Mazda brand globally. As a core model in our lineup, it has always reflected the latest advances in Mazda's vehicle engineering and manufacturing and supported the operations of production facilities worldwide. We want owning a Mazda to enrich our customers' lives so they see us as a partner in their journey through life and stick with the brand for the long haul. Starting this new era with the Mazda3, a model aimed at first-time car buyers, shows our determination to earn customers' trust and become an essential part of their lives. In other words, our determination to make Mazda Premium a reality. As we begin a new chapter in Mazda's history, the mission of the all-new Mazda3 is to amaze and delight customers all over the world. The theme of development was "An object of universal desire." Making a car that would evoke longing in any person would require the creation of a new, hitherto unknown value. We set out to achieve this by applying our human-centric philosophy for dramatic improvements in every area: design, driving performance, NVH, environmental performance and quality feel. The other character is that of a lady or gentlemen who combines dignity with a strong individualistic streak. Their adherence to formality and traditional styles conceals an idiomatic beauty that is breathtaking when glimpsed. This character is embodied in the sedan. Aspiring to create the most gorgeous sedan in its class, we set aside the notion of a C-segment car,* removed all constraints and extended the overall length. We overcame numerous technical challenges in order to keep the hood and trunk low. The resulting proportions are sleek and elegant, giving the impression of a single flowing brushstroke. When walking or running, people make subtle adjustments in the legs, pelvis and spine so that head sway can be controlled using only the slightest muscular effort. In order to make this natural action possible in the car, we redesigned and organically linked every component to draw out people's innate ability to maintain balance. The result is Skyactiv-Vehicle Architecture, a new set of structural technologies that make riding in a car feel as natural and stress-free as walking on your own two feet. In addition, we achieved a comfortable quietness by focusing not only on noise volumes but on the time it takes for sounds to be transmitted and the direction from which they arrive. Next, we built a clear and expressive sound system with speakers positioned to deliver sound directly to the driver's ears and set about creating a comfortable cabin space for all vehicle occupants. Thanks to the benefits of Skyactiv-Vehicle Architecture and the latest Skyactiv gasoline and diesel engines, which allow intuitive control of vehicle speed in any situation, the all-new Mazda3 offers driving pleasure of unprecedented quality. The powertrain lineup includes Skyactiv-X, a new kind of combustion engine that combines the advantages of gasoline and diesel engines. Its innovative Spark-Controlled Compression Ignition system enables us to choose gear settings that accentuate performance without sacrificing emissions or fuel economy. Engine response is quick and driving is smooth with a reassuring feeling of control. Skyactiv-X will realize even greater driving pleasure and superior real-world environmental performance, enhancing the joy the car-ownership. Introduced in 2010 and making its production model debut with the launch of the CX-5 and the Mazda6 in 2012, Mazda's Kodo—Soul of Motion design has been a driving force in enhancing the brand's global value. Mazda now takes it to higher levels of depth and sophistication as it enters a new stage that raises car design to the level of fine art. The goal for this new evolution of Kodo design is to express a new form of elegance inspired by Japanese aesthetics. The first cars to embody Mazda's new design language were the RX-Vision concept model shown at the 2015 Tokyo Motor Show and the Vision Coupe concept model exhibited at the 2017 show. Elements finely honed to create clean, beautiful designs combine with a delicate play of light and reflections to realize elegant and sophisticated styling with a natural, dynamic feel. The new Mazda3 is the first production model to adopt this evolved version of Kodo design. While featuring an extremely simple "single motion" to its overall form, the way light and shadows shift and reflections move over the body gives birth to a highly vital and dramatic expression that goes beyond previous iterations of the design language. 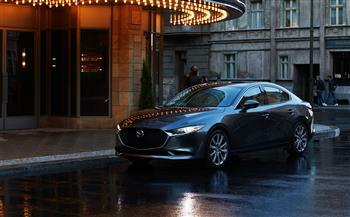 Another goal in styling the new Mazda3 was to give the hatchback its own more emotional design, while the sedan aims to present more elegant proportions. Despite sharing the same Mazda3 model name, the two forms represent entirely different personalities. The design concept for the hatchback focused on creating a solid mass with a seductive appeal that conveys a fresh expression of hatchback styling. When viewed from the rear, the cabin and body come together to appear as a single solid mass. This unique form realizes a powerful, solid presence and an expression of seductive and lasting appeal. The design concept for the sedan is "sleek and elegant." While conforming to traditional sedan styling by bringing together the hood, cabin and trunk as three distinct elements, the development team aimed to elevate those elements and achieve a new level of beauty that befits a Mazda sedan. The result is a refined, mature expression of elegance. A new lamp design is one more element key to Kodo design's further evolution. In keeping with the "less is more" theme, all unnecessary elements are shaved away to leave only the essence of a lighting fixture. The development team felt that limiting the design to the minimum necessary elements – the light source, lens and base – would create a clean and beautiful look. They also pursued a round design with an expression of depth in order to create a presence that accentuates the new Mazda3's physique and fore-aft axis. The new design embodies a dynamic expression that distinguishes the Mazda brand. Polymetal Gray was newly developed as an exclusive color offering for the hatchback. Fusing the hard appearance of metal with plastic's characteristic glossy smoothness creates an entirely new expression of quality. The color changes its expression depending on the light, accentuating the beautiful form of the hatchback's body. To further strengthen the connection between the car and driver, every aspect of the cockpit is laid out in perfect horizontal symmetry with the driver in the center. At the same time, every element is designed to directly face the driver and help emphasize the driver-centered axis that runs from front to rear. Furthermore, the interior incorporates the "less is more" ideal that is a key to the new Mazda3's further-evolved KODO design. Keeping all elements other than the cockpit as simple as possible helps amplify the presence of the cockpit zone. This creates a comfortable environment in which the car and driver engage in a natural dialogue that enables the driver to focus on the task of driving. The cockpit design applies the "vanishing point" concept down to the parts level, including the steering wheel spokes and center display. Along with emphasizing the driver-centered axis running from front to rear through the cockpit zone, this design approach also expresses a second horizontal axis through the layout of the forms that run left and right from the instrument panel out to the door trim on both sides. The design goal was simplicity throughout based on the aesthetics of "less is more." For example, the climate-control panel and passenger-side louvers are integrated into the left-right axis that follows the line of the instrument panel. This results in a clean and simple design. Interior parts employ Mazda's own grain, designed to express the richness and warmth of genuine leather. By introducing creases with differing depth and shapes on different parts, this new material creates a lively rich expression. The newly designed shift panel takes advantage of a technology called "two-layer molding." It incorporates a laser-engraved black layer covered by a second clear layer to present a glossy black finish with a look of deep transparency. Shifts in light create a rich linear expression that helps the panel accentuate the new Mazda3's sporty nature, high-quality appearance, and pride of ownership. The fabric interior adopts a new Greige color, which combines the cool tones of gray with the soft feel of beige to create a pleasing sensation of vitality and warmth. This combination of light and depth gives the interior a sophisticated look. The cockpit and cabin were carefully designed in accordance with Mazda's own human-centric philosophy. One goal was to provide all drivers with a confidence-inspiring ease of operation that helps them to concentrate on driving. Another was to make time spent in transit comfortable and enjoyable. Mazda applied the latest available knowledge and technology in designing the driving position, visibility, Human-Machine Interface (HMI), and audio sound quality. These were leveraged to further elevate the level of quality and satisfaction by delivering a more natural and intuitive feeling to driving. The new Mazda3 provides all occupants with the pleasure of a natural, comfortable and relaxing driving experience that begins with the very first outing and remains consistent in any driving scene. The telescopic steering adopts an additional 10mm of movement at either end to offer a wider adjustment range of 70mm and deliver more precise control over the adjustment of the driving position. In addition, front seat cushion tilt adjustment is now included as standard equipment. This helps prevent the angle of the seat from causing the occupant's thighs to float above the cushion or placing undue pressure on the thighs. As such, it offers firm support that keeps the pelvis in an upright position to maintain the ideal seating posture Mazda has strived to achieve. The gear shift lever was moved forward and positioned higher on both the automatic and manual transmission versions. This makes it easier for the driver to move his or her hand from the steering wheel and to operate the shift lever. The commander control was also moved forward, the cupholders repositioned in front of the shift lever and the center armrest lengthened. This new floor console layout significantly improves operating stability, ease and comfort. The Active Driving Display, meters and center display were all redesigned to present information in a simpler fashion, while the fonts used were unified to create a pleasing and consistent look. The thickness and shape of the A-pillar design were optimized to minimize its obstruction angle and associated blind spots. Every detail of the pillar shape was carefully designed after calculating what degree of neck and eye movement would not burden the driver. As a result, the new design significantly reduces blind spots ahead of the car, providing the driver with a continuous view of pedestrians or potential obstacles to the right or left while maintaining a natural driving posture. The control system for windshield wiper operating speed was carefully designed to improve wiper performance. It is also designed to constantly adjust the operating angle of the wipers in fine increments. This allows them to firmly clean right up to the A-pillar and greatly expand visibility near the A-pillar on the driver's side. The wipers are housed beneath the hood, which helps provide a clear downward view out of the windshield. In addition, the washer nozzles are attached to the wiper arms so their spray can be wiped away immediately after application and not interfere with visibility. These measures combine to provide the driver with a clearer view and to more quickly maintain clear visibility in inclement weather. Mazda Connect now includes a Digital Owner's Manual as one of its app offerings. When a warning appears on the center display, it also presents an indication of the priority level and a link to the Digital Owner's Manual. The driver can then access the manual to quickly receive an explanation of the warning and instructions on how best to respond to the situation. Mazda conducted a series of new studies into how sounds are transmitted through a car's cabin. This led to more efficiently improving sound quality by placing the bass speakers in the corners where the sound is amplified. To avoid the tonal quality of mid- to high-frequency sounds from being affected by reflected sounds, the other speakers were positioned on the left and right sail garnish and upper sections of the door trim where the sound is transmitted directly toward the occupant's ears. This creates a more natural sensation to distinguishing the sound's point of origin and enhances the depth and clarity of that sound. The 8-speaker standard audio system uses a 3-way layout, with 3L woofers positioned on the sides of the front cowl, a pair of 2.5cm squawkers on the sail garnish and 8cm squawkers on the upper section of the front and rear door trim. The 12-speaker Bose® sound system adds an 8cm center speaker, a pair of rear satellite speakers, and a subwoofer. It also features custom tuning to provide more powerful bass and higher audio quality. Mazda's Jinba-ittai driving experience demands that the car works in perfect harmony with the driver's intentions to provide greater safety, confidence and reassurance. In working to achieve this, Mazda has remained committed to building cars according to its human-centric design philosophy. These efforts include advancing its Skyactiv technologies. Beginning with the new Mazda3, they also include the introduction of new technologies that further evolve the level to which human-centric design is applied. The ongoing goal is to realize the ultimate expression of Jinba-ittai by enabling the driver to enjoy the pleasure of driving with natural action, as though moving his or her own body without any need for conscious effort. The new Mazda3 is powered by the latest Skyactiv engines, including Mazda's new Skyactiv-X, and also adopts Skyactiv-Vehicle Architecture. This adds a new layer of polish to its driving dynamics, based on Mazda's human-centric design philosophy. The next generation of Mazda driving pleasure starts here. 1.5-, 2.0- and 2.5-liter versions of the latest Skyactiv-G comprise the gasoline engine lineup for the new Mazda3. All three adopt optimized intake ports and piston shape, split fuel injection and a coolant control valve to deliver higher levels of dynamic performance, fuel economy and environmental friendliness. The Skyactiv-D 1.8 is the diesel engine offering for the new Mazda3. Incorporating ultra-high-response multi-hole piezo injectors allows the engine to utilize high-pressure, precisely controlled multi-stage injection. This realizes a finer balance of enhanced fuel economy, quietness and reduced exhaust gases, while also delivering smoother, more robust performance. All-new Mazda3 is the first production car to offer Mazda's innovative Skyactiv-X engine. Features include superior initial response, powerful torque, faithful linear response and free-revving performance. The engine is assisted by Mazda's intelligent new M Hybrid system, which supports greater gains in fuel economy, and achieves higher levels of driving pleasure and environmental friendliness. Mazda's evolved i-Activ AWD newly adds "four-wheel vertical load" detection and works in harmony with G-Vectoring Control Plus (GVC Plus) to control torque distribution between the front and rear wheels. As a result, it is fully capable of responding faithfully to the driver's intentions, regardless of the driving scene. It also reduces overall mechanical loss by approximately 60% over the previous model and contributes to improved fuel economy. The seats adopt a basic structure designed to maintain the natural S-shaped curve of the spine. The seat cushion and lower seatback support the lower pelvis, upper pelvis and thighs to keep the pelvis in an upright position. Meanwhile, the upper seatback bolsters the gravity center of the rib cage. This structure enables the driver to stabilize his or her head in a natural fashion by shifting his or her pelvis and spine to maintain balance without any conscious effort. The body further evolves Mazda's straight framework and continuous ring structure concept. New front-to-back connections complement the existing vertical and lateral connections of the previous body to form multi-directional ring structures. This increases rigidity while reducing lag in the transmission of energy, which helps maximize the function of the dampers and tires. By concentrating energy input from the road surface in specifically chosen locations and adopting a newly developed damping structure that helps absorb it, vibration that causes noise is reduced without increasing vehicle weight. As a result of Mazda's human research studies, development focused on three sound characteristics that directly impact cabin occupants. Those are sound volume, changes in pitch and tone over time, and the direction from which sounds originate. Suppressing noise generation and reducing its volume, while also controlling the fluctuations in and direction of sounds, are aimed not only at achieving a "quiet" cabin environment. Rather, the goal is to provide a "high-quality quietness" that is satisfying to all cabin occupants. To improve the basic insulation qualities key to reducing NVH, the new Mazda3 marks Mazda's first application of a "two-wall" structure that leaves space between the body and carpeting on the floor. By considering the carpet and the body panel as two walls, and then designing them to match the characteristics of the fiber material attached to the carpet increases efficiency without increasing weight. The number of holes in the carpeting was also reduced wherever possible to significantly enhance sound insulation. Measures to deal with road noise focused on minimizing noise and vibrations, and to make any noises transmitted when the road surface changes reach the ears of cabin occupants in a linear fashion. Sound-absorbing functionality added to the headliner and floor mats effectively suppresses high-frequency noise. Tires with optimized vertical spring action and increased rigidity at possible entry points help prevent the transmission of unwanted vibrations to the cabin. Lag-free transmission of permitted sounds and vibrations create a more reassuring and comfortable cabin environment. The fundamental aims of Mazda Proactive Safety are to offer the driver confidence-building reassurance and to offer all cabin occupants a thoroughly enjoyable driving experience. Based on this philosophy, the development team worked hard to evolve basic safety technologies such as the driving position, pedal layout and good visibility, advanced i-Activsense technologies, as well as passive safety technologies designed to protect cabin occupants in the event a collision should occur. With an eye on the future, Mazda is constantly making efforts to further evolve the level of safety offered by its cars. The aim is to provide a safe and reassuring driving experience to everybody, from novice drivers with little time behind the wheel, to elderly drivers, and including passengers in the rear seats. Mazda is committed to further advancing its safety technologies as it works step by step toward making car accidents a thing of the past. The new Mazda3 is available with Mazda's newly developed Driver Monitoring system. The system uses both an infrared camera and infrared LED to observe the driver's condition while driving. It monitors how wide open the driver's eyelids are at any given time, the number of times he or she blinks, and also the angle of the mouth and face in order to determine the level of drowsiness or fatigue. It also monitors the driver's line of sight and eye movement to determine when the driver is being inattentive. If the system judges that the situation has become dangerous, it sounds an alert to make the driver aware and works in conjunction with the Smart Brake Support (SBS) system to shorten the time required for the brake warning to sound. Front Cross Traffic Alert (FCTA) is available on the new Mazda3. The system uses newly adopted front side radars to detect other vehicles approaching from blind spots at the front right or left of the vehicle and alert the driver of their presence. This helps prevent a common cause of accidents, when cars enter a T intersection with a partially obscured view. Also available on the new Mazda3 is Mazda's new Cruising & Traffic Support (CTS) system. CTS contributes to reducing driver fatigue by assisting with accelerator, brake pedal and steering operations when stuck in traffic jams on the highway. It also supports a safer, more reassuring and more comfortable driving experience in conditions that demand constant operation of the assisted functions. The new Mazda3 introduces a new knee airbag for the driver's seat. It is not only a first on a Mazda car, but will be included as standard equipment worldwide. By suppressing forward motion of the driver's body in the event of a collision, this new airbag contributes to fewer injuries to the driver's legs, chest and abdomen. Each of the side airbags is divided into a front and rear chamber. Using reduced air pressure in the forward chamber and higher pressure in the rear chamber reduces the load taken by the rib cage, while firmly holding the body in place. The hood adopts a new energy-absorbing inner structure designed to receive the impact of a pedestrian's head in the initial moment of contact and then gradually dampen the force to more quickly absorb the impact energy. The front bumper is designed to support the thigh and shins if contact is made with a pedestrian's legs while softening the blow to the knee area. This reduces the degree of injury to the knees and ligaments due to bending and twisting. Corporate Communications Division, Mazda Motor Corporation.